Audi had no problem selling its entire allocation of R8 GTs after the car debuted at the Paris Auto Show. It shouldn't be a surprise. After all, the GT is Audi's ultimate version of the R8 with a 560-horsepower V10 engine and extensive use of carbon fiber components. The Four Ringed Automaker claims a 0-60 mph time of 3.6 seconds and a top speed of a touch under 200 mph. Only a limited number will be produced as well, with a scant 333 available worldwide. Those lucky few customers will soon be getting their hands on the cars, as Audi has announced it has recently started deliveries of the R8 GT. The very first customer, a UK resident, took possession of his new car painted in Phantom Black. Color us jealous. Audi's PR on the delivery of the first R8 GT is after the jump. Feel free to ignore that entirely, though, if you find yourself caught up in the high-res image gallery below... we understand. 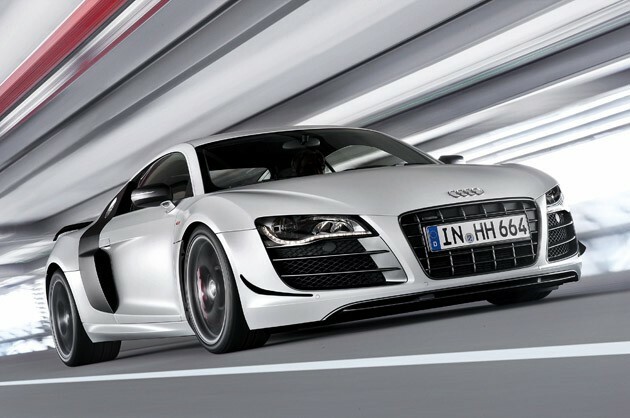 First Audi R8 GT delivered to customer originally appeared on Autoblog on Tue, 19 Apr 2011 17:58:00 EST. Please see our terms for use of feeds.